Buying the best cat harness available allows you to give your cat a safe and secure way to explore the world outside their front door. Buying this harness gives you the peace of mind that comes with knowing that your feline is going to be safe when they're out and enjoying their adventure. We want to help you pick out the best harness available that will keep your cat safe while still being practical and light enough to wear for extended periods. Our buying guide will help you understand what you should look for in your new harness, and our top five picks will let you compare several options quickly and easily. H-Style - This style features a thin "H-shaped" strip of material that wraps behind and in front of your cat's legs before securing along their back. It's important to pay attention to what your cat likes and doesn't like because the thinner straps do squeeze their body. Step-In - This harness lets you lay it on the ground, have your cat step in, and you secure it by lifting the ends up over their shoulders and clipping it along their back. You don't have to put it over their head, but it can be easier to escape from. Vest - Vest harnesses come with more fabric that slips over your cats head and has leg holes. It fits them like a small vest, is very secure, and they usually clip along your cat's back for a secure fit. Cats are curious creatures that like to get out and explore their surroundings. One easy way to let them explore while you keep them safe is by leash training them and taking them out when a harness. Most people like to use harnesses because it helps to ensure that they have control of their cat the entire time the cat is outdoors. This can help prevent any accidents or injuries, and you won't have to worry about your cat running off and getting lost. 1. Lay the leash and harness next to your cat's food bowl and leave it there for a few days. 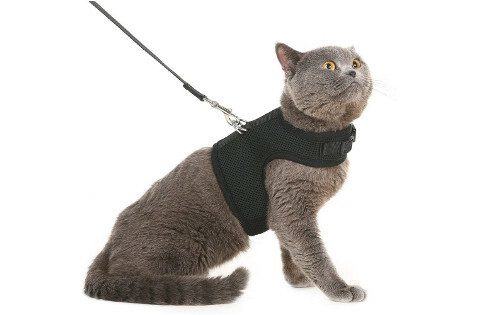 This will let your cat familiarize themselves with the harness in a non-threatening environment. 2. Open and close the snaps or velcro strips several times near your cat to get them used to the sound of it. This can help stop your cat from getting scared the first few times you put the harness on and take it off. 3. After a few days of familiarizing your cat with the harness, open it and gentle drape it over your cat's back. When you're doing this, feed your cat their favorite treats to start establishing positive associations with the harness. 4. Repeat step three for several days. Eventually, your cat will start getting excited to have the harness on because they've associated it with something positive like their favorite food or treats. 5. Start fastening the harness on your cat for a few minutes at a time for a few more days. Each time you put the harness on, give your cats one or two of their favorite treats like you did in step three. 6. 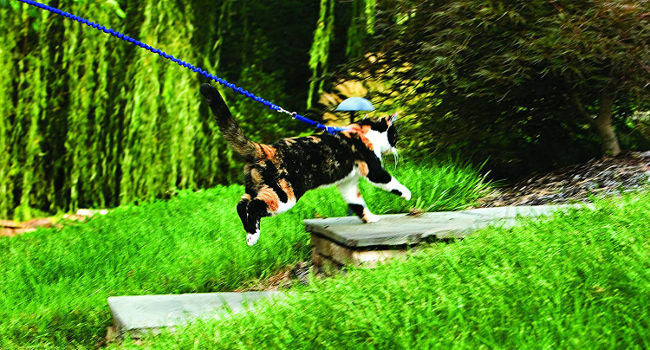 Start taking your cat on short walks around the house to get them used to walking on a leash. When they're comfortable with this, you can take them outside and on longer walks. You want to pay close attention to the harness you pick out because not all cat harnesses are the same. 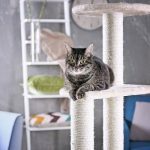 We've rounded up the most important buying considerations that you want to keep in mind when you're shopping to help ensure that you get a secure and safe harness for your cat. Having a breathable and lightweight fabric allows you to leave the harness on your cat for extended periods without worrying about them overheating or getting sore spots from the harness rubbing. Make sure that you're not trading durability for breathability though because this could be dangerous for your cat. Do you want a velcro closure, a clasp closure, or both on your cat's harness? Velcro is easier to put on and take off, but a clasp closure is usually more secure for your cat if they're active or like to pull when they're walking. Some harnesses even come with velcro as the first closure with one clasp that secures around your cat's neck. Although most cat harnesses aren't very expensive, you do want to make sure that it comes with durable materials to help keep your cat safe. You want to pay attention to the adjustment points, fabric, seams, leash attachments, and the edges of the harness because these can be weak points. Most harnesses come in small, medium, or large sizes that allow you to tailor the harness to the largest point on your cat's chest for a secure fit. It's a good idea to measure your cat and match your cat's measurements up with the recommended harness sizes before you buy it. Be sure to double check whether or not your harness comes with a leash because some do come with a compatible leash included. If it doesn't, you want to pay close attention to how the leash attaches to the harness and where it attaches to ensure that it fits comfortably. Your harness should have safety features like additional clasps if the harness comes with a velcro closure or a reflective strip that runs around the harness so you can see your cat after dusk. Not all harnesses come with these features, and you want your cat to stay as safe as possible. The PetSafe cat harness comes in three different sizes ranging from small up to large as well as six different color combinations that allows you to customize your selection to suit your style. The harness comes designed especially for comfort because you put pressure on your cat's shoulder and chest area rather than on their necks. You'll get two different adjustment points that allow you to quickly and easily get a secure and snug fit that helps to ensure that your cat doesn't get out. The leash helps to prevent your cat from hitting the end and jerking because it's slightly stretchy with a little give before you get to the end. The harness comes with a secure D-ring attachment point that features a metal design with double stitching for added durability. You can quickly and easily wash this harness and leash by tossing them in the washing machine and putting them on tumble dry between uses. Cat parents who bought this leash and harness set were very happy that the leash features a slightly stretchy bungee design that stops their cats from jerking to a stop. Cat parents did note that the adjustment points can slip after several uses. This cat harness by Kitty Holster comes in four sizes that start at extra small and go up to extra large as well as five different solid colors and two fun patterned options. This travel and walking vest comes made out of a soft and breathable outer layer that has a 100-percent polyester lining for comfort. This harness comes equipped with durable and large velcro closures for quick adjustments, taking off, and putting on capabilities. The D-ring attachment point is built right into the back of the harness with an additional braided fabric layer for added security and durability. Each harness is designed to be comfortable for wearing for extended trips or periods of time because it comes with a breathable and lightweight design. This fabric makes it easy to clean and care for because you can simply toss it into the washing machine and tumble dry it if it gets dirty. Cat owners who bought this harness by Kitty Holster liked that the D-ring attachment came with an additional reinforced strip of fabric to secure it. They didn't like that the harness is only held together with velcro and no additional closures. This soft and secure corduroy cat harness from Best Pet Supplies allows you to choose from 14 different colors and five different sizes ranging from extra small up to extra large. The harness comes with a quick release buckle that buckles the harness closed over your cat's back for added security. The soft but plush feel of the harness's fabric allows your cat to wear this harness for extended periods without worrying about irritation or sore spots from it rubbing as your cat moves. You get multiple adjustment points that ensure you'll get a secure fit each time you put it on your cat. Cleaning this harness is easy because it's machine washable on cold, and you just lay it flat to dry when you finish washing it. The no-pull design of this harness puts light pressure on your cat's shoulders and chest region instead of on their necks. Cat parents were happy that this harness came with a very soft and breathable fabric that allowed their cats to wear this harness for an extended time without issues. They did say that this harness is a little on the heavier side because it has two large D-rings attached. This cat harness comes with an additional safety feature in the form of a soft but durable closure that snaps closed and it sewn into the actual harness. 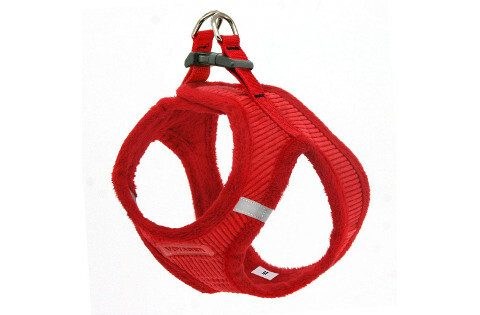 The closures also feature thick strips of velcro that overlap and allow you to quickly and easily close the harness. You'll choose from a soft and breathable fabric that comes in four solid colors and six different spotted or checkered patterns. The neck, back, and leg holes all feature a very soft fleece fabric that won't pinch, irritate, or rub your cat as they run around and wear the harness. This harness comes with a leash along with two medium D-rings sewed into the harness's back and reinforced with additional fabric for added security and durability. You'll pick from three different sizes including small, medium, and large that allows you to get a snug and secure fit for cats of all sizes. Cat parents who bought this harness were happy that it came in several different color and pattern choices with soft and breathable fabric. Cat parents did note that this harness did tend to fray around the neck and leg holes with repeated washing. You'll get a comfortable, lightweight, and breathable mesh material when you buy this harness that comes with a secure clasp for added security. It has a reflective strip that starts at the back and runs around the front of the harness that allows you to take your cat out after dusk. You'll get two different adjustment buckles on this harness that allow you to quickly and easily loosen or tighten the harness to fit your cat's chest and waist. There is an additional abdominal pad in the front of the harness that helps to keep your cat comfortable if they pull when they're out and about. The neck and leg holes on this harness feature an additional layer of fabric with double stitching for added durability that helps to prevent rips, tears, and fraying. You get eight different colors and five different size options that make it quick and easy to tailor the harness to suit your cat's size. People who bought this harness for their cats liked that it had a reflective strip that wrapped around the front of the harness as an added safety measure. They did say that the harness can slip and move around if their cat is very active while they wear it. What's the Best Cat Harness? 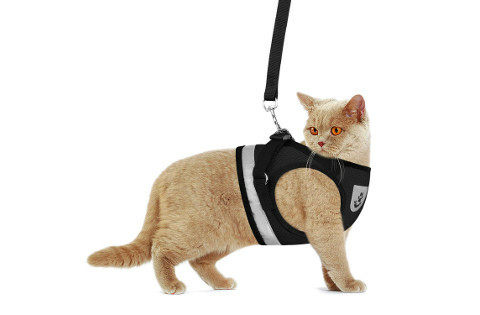 Our pick for the best cat harness is the PetSafe Come with Me Kitty Harness because it comes with different adjustment points that allow you to get a snug fit quickly and easily. We also liked that the leash had a slightly stretchy design that stops your cat from jerking to a stop if they choose to pull on the leash. The double stitching around the D-ring leash attachment was also a nice touch because it helped to ensure that the leash stayed secure. 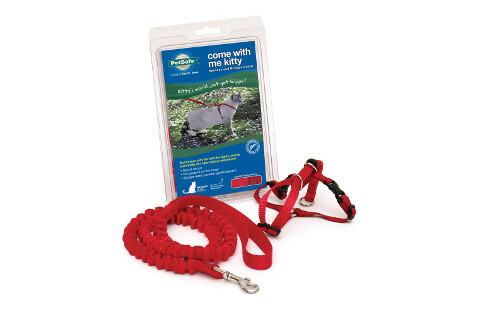 Finally, we liked that this leash and harness set was very easy to wash and clean in the washer and dryer.